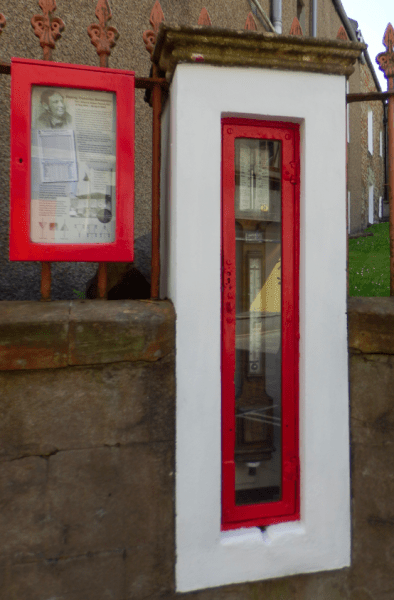 A Fitzroy Fisheries barometer in Stromness, which has provided weather guidance to sailors for over 150 years, has been restored by the Stromness Townscape Heritage Initiative. The barometer, dates from the 1850’s and is one of less than 100 in the UK. Situated on a wall near to the Church of Scotland in the town, it hasn’t been in a good enough condition to be used for weather forecasting for a number of years. Therefore the Stromness THI provided funding for restoration works to be carried out to the barometer and its casing. The works were completed by local man Mark Shiner and will help to protect the barometer and ensure that it continues to operate correctly. Interpretation was also installed, within the case to help people appreciate the history and significance of the piece. ‘Fishery’ barometers’ were designed in 1857 by Vice-Admiral Robert Fitzroy and laid the foundations of modern weather forecasting. The barometers were used to communicate weather observations to the local community and to Fitzroy’s London office by telegraph. Fitzroy’s aim was to make weather information more widely available for ships and fishermen and therefore charts which forecasted the weather were located next to the barometers for crews to consult before going to sea. In addition, if bad weather was imminent, to warn the ships in port and at sea a storm cone would be raised on the pier. The Stromness THI has been underway in the Stromness Conservation Area since July 2009, and will finish in June 2014. The original £3.56 million of THI funding has secured a total project investment value of £6.25 million of public and private funding for Stromness. £4.8 million of work has been awarded to local businesses, and over 55 property grants have been awarded. The overarching aim of the Stromness THI is to aid the regeneration of the town centre, ensuring economic viability through investment in the built heritage. The initiative is funded by Heritage Lottery Fund (HLF) and other partners, notably Historic Scotland and OIC. The HLF funded element is £1.44 million and the total for the scheme approx £3.426 million. Other delivery partners in the project are: Orkney College, Visit Orkney, Orkney Tour Guides Association, Construction Skills, Stromness Business.